You are here: Home » News » Drop Shot Denny’s Summer 2014 SALE! **Summer SALE now through September 30, 2014! 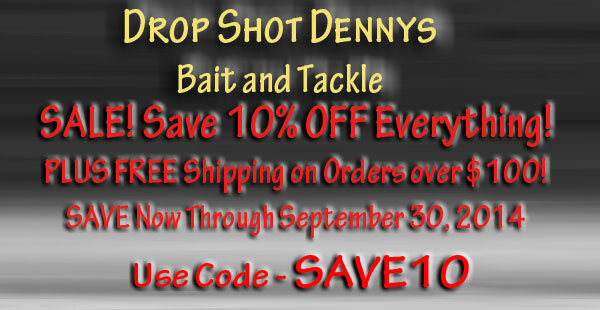 ** SAVE 10% OFF everything online at Drop Shot Denny’s Bait & Tackle during this BIG Online SALE! Use coupon code SAVE10 at checkout to cut 10% off your entire order! PLUS! FREE SHIPPING on orders over $100.00 through September 30, 2014. No coupon or code needed for FREE Shipping! Just order over $100.00 in product in one order (after 10% discount) and shipping is FREE! Everything includes the new Drop Shot Dingers and the WaveSpin Legend 250 Tangle Free Spinning Reel! STOCK UP NOW! This deal won’t last forever!! « Drop Shot Denny’s April 2014 SALE!